Lenny McLean – fighter, actor, hard man, legend. One of the most notorious figures ever to emerge from the East End of London, he had a reputation that was held dear by his friends and associates and feared by his enemies. His life-story is now part of modern-day history, but for the millions of people wanting to know more about the great man, here, at last, is a compilation of stories and memories from those whose lives he touched. In this fantastic book, friends, family, colleagues and adversaries have all come together to share their memories of how they knew the great man and the part he played in their lives. 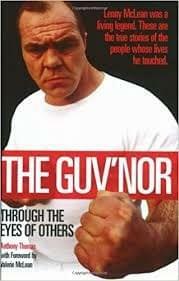 Although a formidable fighter and a feared enemy, these first-hand accounts tell of a man who had a big heart, who was generous and who always had time for his friends.Anthony Thomas has spent years collating these original accounts of what it meant to be a friend and associate of the Guv’nor. The famous, the infamous, family and friends all have a chance to share their memories. Affectionate, Funny and incisive, this is a book that all Lenny fans will treasure, and which no Guv’nor aficionado should be without.